Mighty Merloe, HL Enloe’s ORMA 60, flew across the Sea of Cortez Monday and crossed the finish line to set new multihull and overall record for the San Diego to Puerto Vallarta Race. The previous record was set in 2014 by Tom Siebel’s MOD70 trimaran Orion, sailing 1,209 miles in 56h:55:m for the 1,000-mile rhumbline course. Mighty Merloe was three hours behind them that year but suffered from a broken centerboard on one of the hulls. The new 2018 record now stands at 51h:58m, sailing 1,136 miles, at an average speed of 21.8 over the 1,000-mile rhumbline course. Mighty Merloe is nearly 15 years old now, and recently she has been getting some deserved work to “tighten up” the hull. You can only imagine the stress placed on various features of the outboard amas, crossbeams, and mast components. With a new record in hand, it seems to have been worth it. “When I bring professional sailors on board from Europe, part of their program is to train the younger local teammates to trim and steer [the boat].” Crewmember Will Suto did his homework and showed off his skills. During the last day of the race, Enloe described Suto steering the 60-footer with only the leeward ama in the water and carving a course through the swells while keeping the boat speed at 30-plus knots. 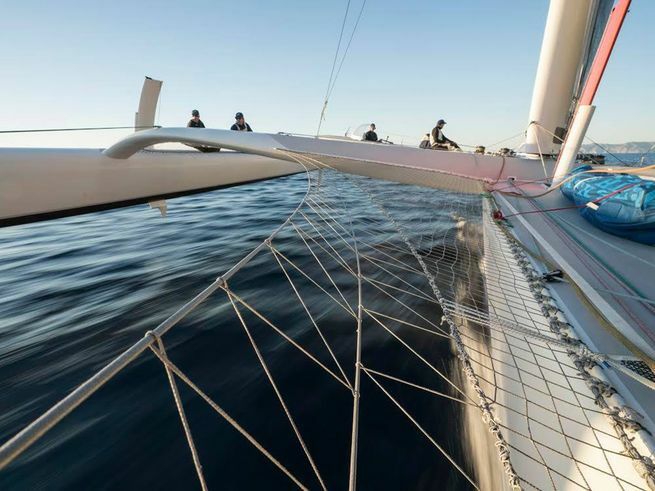 For the rest of the fleet, they are punching their way through that lee, and perhaps thinking back to Peter Isler’s competitor briefing where he described the nuances of a ‘in close, out wide’ approach to the wind shadow in the lee of Cabo, and the third ‘leg’ of the race. Racers will be working most of today to pace themselves to the other side and ‘reattach’ to the northerly flow pumping out of the Sea of Cortez.